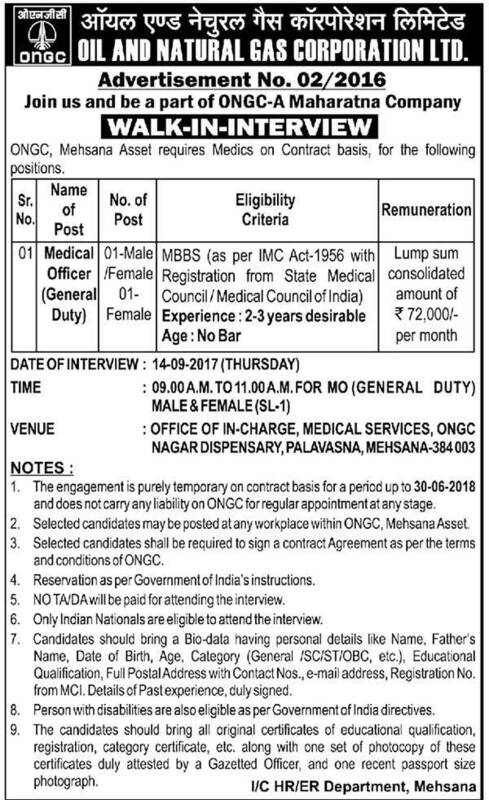 Oil and Natural Gas Corporation Limited (ONGC), Mehsana Published Recruitment Advertisement for Medical Officers (General Duty) Posts. View More Information like Posts Name, Qualification, Experience, Salary, Interview Date, Interview Address etc.. are Given Below. Experience : 2-3 years Desirable. Walk in Interview Address : Office of In-Charge, Medical Service, ONGC Nagar Dispensary, Palavasna, Mehsana - 384003.